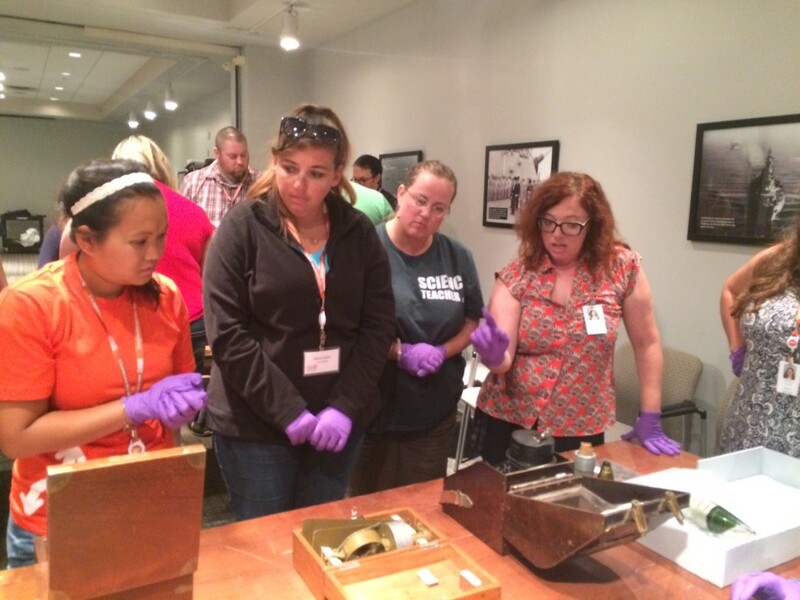 During WWII many factories changed their production from peacetime to wartime products. One General Electric factory in Cleveland, OH, went from making Christmas lights to a top-secret electronic device protected by security surpassed only by the Manhattan Project and the D-Day invasion of Normandy. From 1939-1942 radar researchers in England tested a variety of devices that might be used to improve the effectiveness of anti-aircraft artillery. These artillery cause the most damage when they explode a short distance from their target. Detonation timing was based on a set timer or on impact, neither of which were efficient. 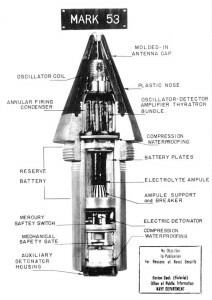 The idea being researched in England was that a small radio transmitter, coupled with an equally small receiver, could be mounted on the nose of a missile. The transmitter’s signal would bounce back, and the interaction of the sent and received signals could be used to estimate proximity to a target. 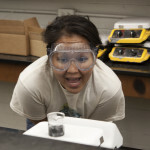 These electronics required a battery, and had to be tough enough to withstand launch. The English called the technology VT, or Variable Timer fuzes. It was later called a Proximity fuse. The Tizard mission brought the plans and data from these tests to the US, and the NRDC prioritized development and production of the fuses. Some improvements were made, and by 1944 a significant proportion of all US electronics output was parts for Proximity fuses. These were made by many companies, including RCA, Eastman Kodak, and Sylvania, in the the first mass-production of printed circuits. Julius Rosenberg stole some of this technology and passed it to the Soviet Union. The US military was so concerned about the secrecy of Proximity fuses that they limited its use where German forces might capture unused or unexploded devices. Vannevar Bush, head of the Office of Scientific Research and Development during the war viewed Proximity fuses as of special importance to Allied success, crediting them with a sevenfold increase in effectiveness in defense against Kamikaze attacks, neutralization of V-1 attacks, and in its use in the Battle of the Bulge against land troops. The triggers were so sensitive that they occasionally took out unfortunate seagulls. Eventually Proximity fuses were used in bombing Japanese cities, and today’s current weapons use similar principles for detonation. The Germans had been developing similar technology in the 1930s, but dropped it for other weapons with more immediate promise shortly after 1940. 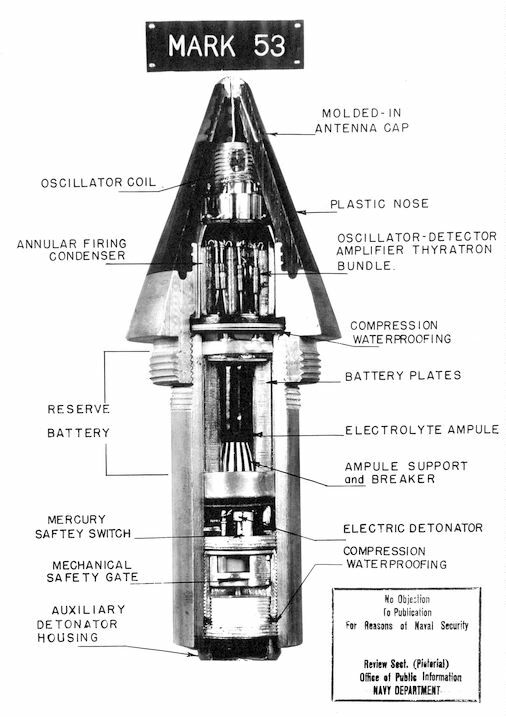 A diagram of the Proximity fuse, published shortly after WWII. From Wikimedia Commons. 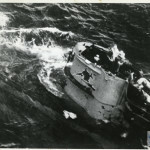 Seventy five years ago, although the U.S. was not officially engaged in the war, ships under the flag and carrying U.S. goods and passengers were being attacked by German U-boats. In June 1941 the SS Robin Moor, though carrying no military supplies or personnel, was sunk by U-69 off the coast of Sierra Leone after passengers and crew were given a short time to evacuate on life boats. 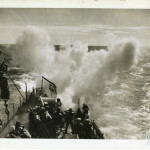 The U-Boat 552 sank the U.S. naval destroyer USS Reuben James on 31 of October 1941, off the coast of Iceland. The Battle of the Atlantic began in 1939 when Germany began a blockade of England. The balance of power and nature of the battle changed over the years. With the loss of the French Navy and the occupation of Norway in 1940, England lost an ally and the Germans were able to add to the numbers of U-boats in the Atlantic, and to use French bases to launch ships. Germany had the upper hand in the long-running battle from June 1940 until early 1941. The British Navy responded by moving to larger and less frequent convoys, and the U.S. added some escorts to defense of cargo ships. England also shared its developments in ASDIC (later called SONAR) and depth charges with the U.S., but there were great limitations to the early technology. 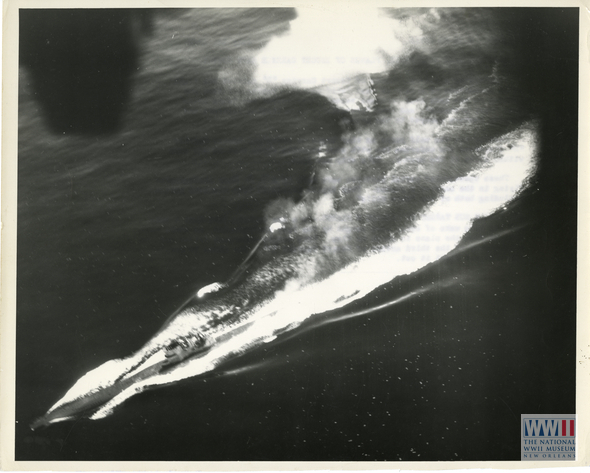 The depth charges went only to half the depth the U-boats could dive, and ASDIC could not be used in close proximity to submarines, or at all on surface vessels. In early 1941 the British changed coordination of convoy escorts, and their casualty rate declined. Radar sets that tracked broadcasting submarines further aided the Royal Navy in locating U-boats. In response, Admiral Donitz, who commanded the German U-boat fleet, moved his ‘wolf-packs’ hunting convoys farther west into the Atlantic, in a gap in air support that left the convoys particularly vulnerable. When, in the middle of 1941, British codebreakers began to reliably translate Enigma codes, the battle swung in the advantage of the Allies, but this reprieve was brief. German production of U-boats overwhelmed that advantage in late 1941 and convoy casualties again began to rise. When the U.S. entered the war at the end of 1941, Donitz directly targeted the ports of the eastern seaboard. In early 1942 U-boats patrolled the coast of the U.S. and sank over a million tons of cargo without losing a single submarine. 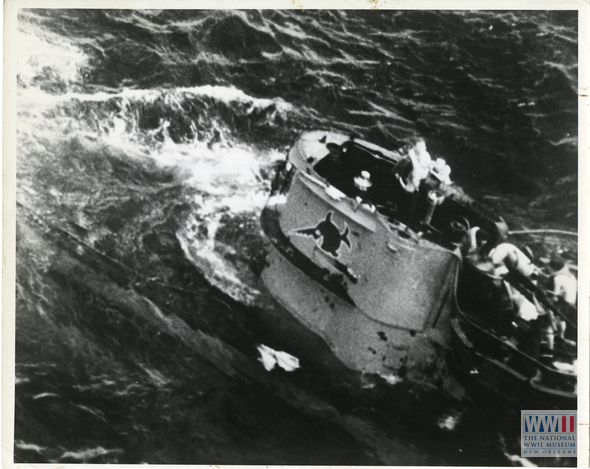 As the U.S. began escorting convoys, they pushed the U-boats back into the mid-Atlantic. Convoy losses were large, but not critical at this time. Through 1942 and 1943 technological advances by the Allies shifted the balance of naval power. The Allies began to use ‘hedgehogs,’ contact-fuzed bombs, and Leigh lights. U-boats ran on batteries will below and surfaced to recharge batteries, replenish air, and attack. They could move much more quickly on the surface than below. The early RADAR systems could not detect at short range, and so the Leigh lights allowed aircraft to spot surfaced U-boats. Allied losses rose again in the Spring of 1943, as the number of U-boats peaked and the Germans improved the Enigma key, making their code unreadable for a period of a couple of weeks. But further technological advances on the part of the Allies finally decided the Battle of the Atlantic over the Summer of 1943. There were finally long-range aircraft in place that could hunt and destroy U-boats. Anti-ship modified B-24s based in Newfoundland supported convoys in the mid-Atlantic. Additionally, centimeter-band RADAR technology was deployed on aircraft and ships. This more sophisticated RADAR allowed location of U-boats by ships and planes, and was undetectable by German technology. The Allies pressed their new advantage, and focused resources on the Bay of Biscay, where the Germans based most of their U-boats. This finally reduced the efficacy of the German U-boat fleet. Without victory on the Atlantic, it is doubtful the Allies would have been able to move the troops and supplies into position for the invasion of Normandy. In fact, in Spring 1943 there was serious doubt whether England had enough food and supplies to survive even without sending material overseas. 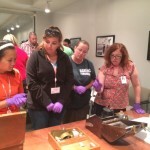 Innovation in technology and its deployment won the Battle of the Atlantic. 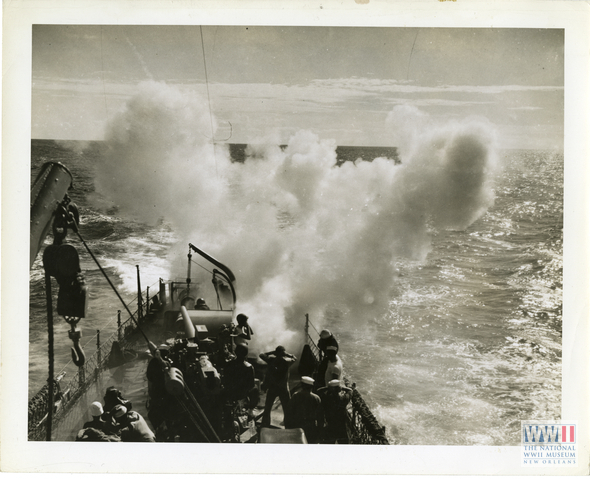 A US patrol boat dropping a depth charge. 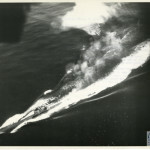 A U-boat as it is hit by a torpedo. You’ve probably seen that video of the Tacoma Narrows Bridge vibrating in heavy winds and then breaking apart. That happened November 7, 1940, less than one year after it opened. The storm producing the 35-45 mph winds that took the bridge down formed off the coast of Washington days earlier, and a few days later killed more than 100 people in the Midwest. 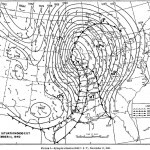 November 11, 1940, was a warm day, in the upper 50s and 60s in the Midwest. It being a holiday (in celebration of the WWI’s armistice) many went out hunting that day. By the end of the day that would change, as a low-pressure system moved up from the southern plains into lower Wisconsin, and Arctic air and wet Gulf of Mexico air fed into the storm on either side. From Nebraska in the south to Michigan and Minnesota in the north, temperatures dropped by about 50 degrees Fahrenheit, and winds whipped at 50-80 mph. The cold and wet air masses combined to produce up to 30 inches of snow, that piled into drifts 20 feet high. Hunters who left home in light jackets, and were amazed to see so many ducks flying southward, were soon stranded in a blizzard. Roads closed, trains derailed, and phone and telegraph lines were cut, leaving communications down and supplies delayed. Storm fatalities totaled 145, mostly duck hunters, and sailors on commercial ships on the Great Lakes. An estimated 1.5 million turkeys, planned to be on Thanksgiving tables, died of exposure. It was also the end of the orchards of northern Iowa, where many apples are produced. The cold snap killed almost all the trees, and led farmers to plant crops that wouldn’t take years to come to harvest. The storm also led to changes in US meteorological systems. Before the storm, all the Midwest forecasts came out of Chicago, and the office operated only during business hours. 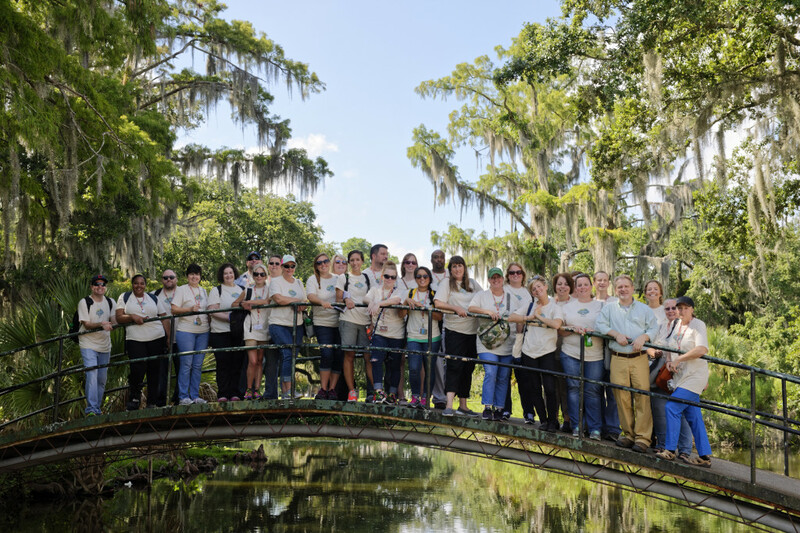 After the storm, more regional offices were formed, and staffing and forecasting became a 24-hour-a-day business. Some stranded in trains and ships run aground waited days for rescue. Fuel and food were significantly delayed to the region, and coming late in the Depression this was a serious hardship. Just over a year before the Pearl Harbor attack, the Armistice Day blizzard had a significant impact on the United States in many ways. It showed the local, state, and federal governments to be lacking in logistics and support of citizens. 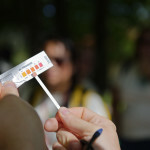 It also contributed to the anxiety of a population coming out of the Depression and unnerved by the news from overseas. The storm came ashore in Washington, moving first southeast, east, and then northeast. The dots on the map here represent the storm's position every 6 hours. 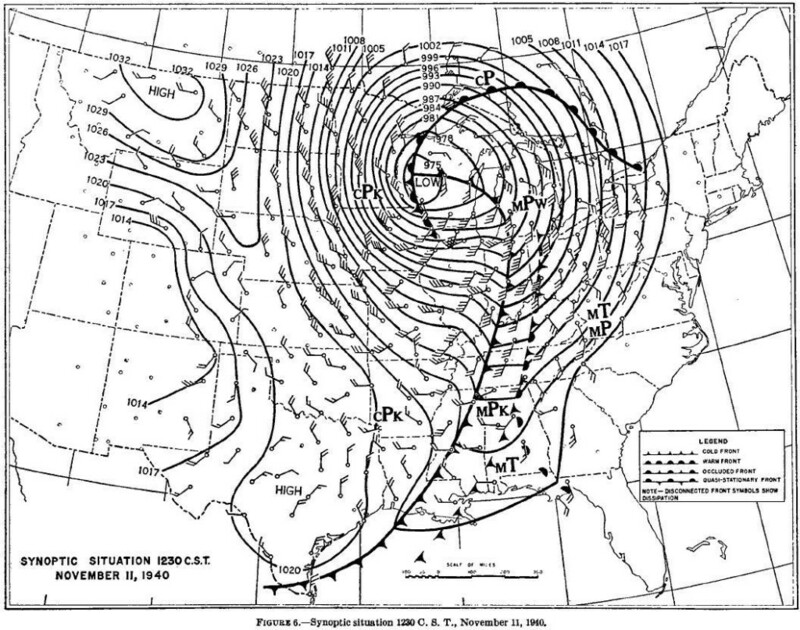 This map shows the winds and fronts around the low pressure system early on November 11, 1940. 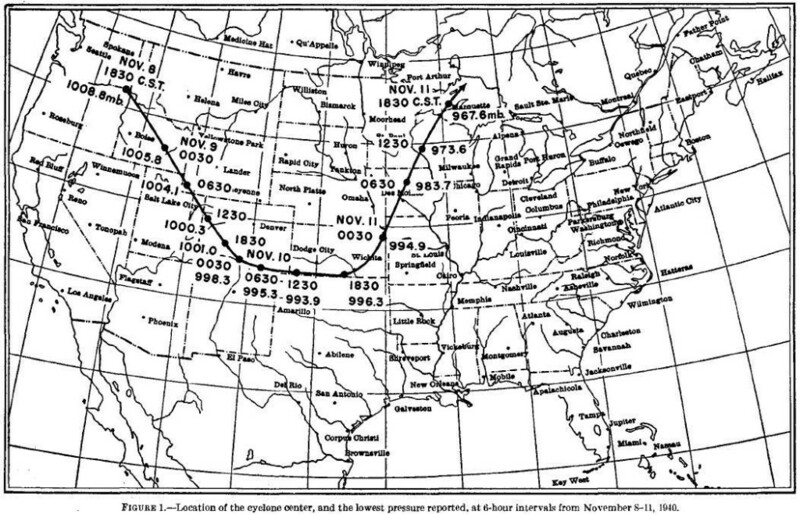 This map shows the position of the weather elements mid-day on November 11, 1940. Seventy one years ago, on October 8 1945, Percy Spencer filed a patent for a cooking oven powered by microwave radiation. He worked for Raytheon, who owned his intellectual property, so Spencer got a $2,000 stipend but no royalties for his invention. Percy Spencer, born in rural Maine in 1896, had a very hard early life. His father died before he was 2 years old, and when his mom couldn’t support him after that she left him with an aunt and uncle. That uncle died shortly thereafter. Percy was working in a mill by 12, and as an electrician at 14. 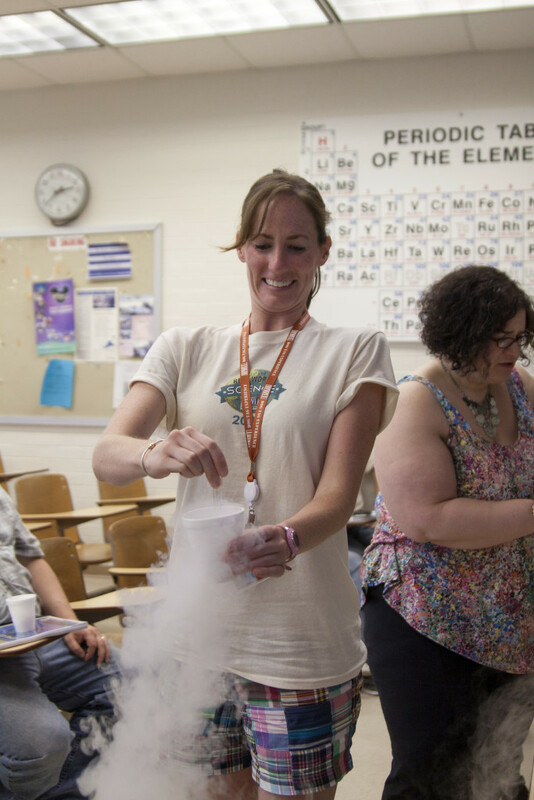 He enlisted in the Navy with an interest in radio, and learned there about the science of making and using electromagnetic waves to send information. By 1939 he was an expert on radar tubes, and was working for Raytheon. Most of the government’s research on radar leading up to WWII was being conducted at MIT’s Radiation Laboratory and Raytheon won the contract based largely on Spencer’s reputation. At Raytheon Spencer developed new manufacturing techniques to build radar tubes much faster. In 1940 the Tizard mission brought UK radar technology to the US, including a cavity magnetron that greatly improved radar technology. When Spencer was experimenting with magnetrons he discovered that a snack bar he had in his pocket had melted. He was not the first to notice that magnetrons created heat energy, but the next day he was the first to experiment with it. 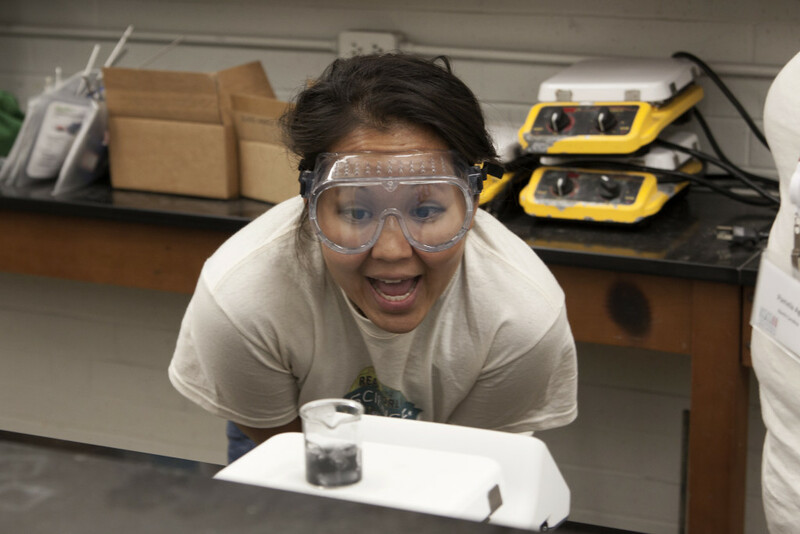 Spencer put a container of popcorn over the magnetron and made the first microwave popcorn. He worked to contain the waves in a metal box and focus their energy. 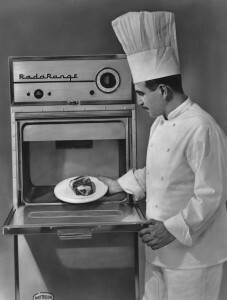 The first commercial microwave oven was made in 1945, but was very large and expensive. They became smaller and more affordable as the decades passed. On September 27 of 1940 a vehicle prototype made by American Bantam Car Company began testing at Camp Holabird in Maryland. 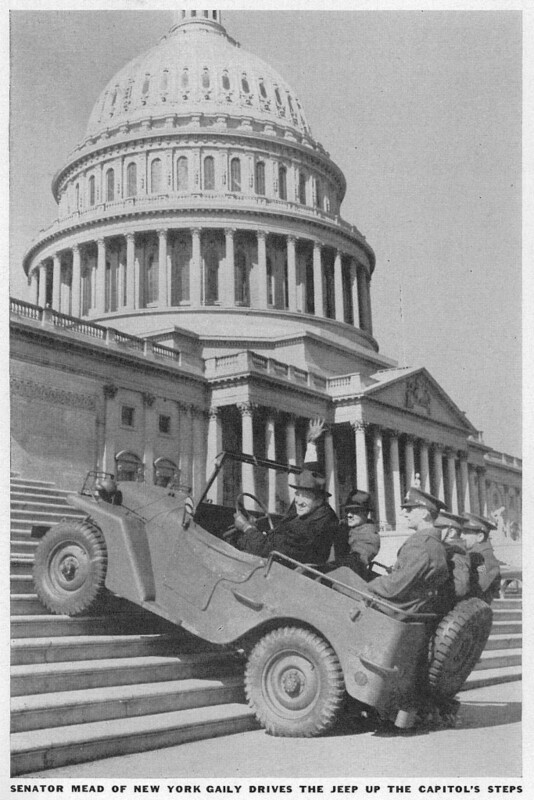 Bantam was the only company to respond to a request from the military for a small, lightweight, powerful, 4-wheel drive vehicle. The car tested well, but there were concerns about Bantam’s size and financial state, so the government gave Willys Overland and Ford a chance to study the vehicle and copies of its blueprints. Willys and Ford submitted prototypes in November of 1940, and they also tested well, and were not-surprisingly all very similar. Orders were placed for 1,500 vehicles from each company. The first 4-wheel drive vehicles were made for the military in WWI by the Four Wheel Drive Auto Company and Thomas B Jeffrey Company. After WWII, Willys produced the CJ (Civilian Jeep), and when American Bantam went bankrupt in 1950 Willys was granted the Jeep trademark. 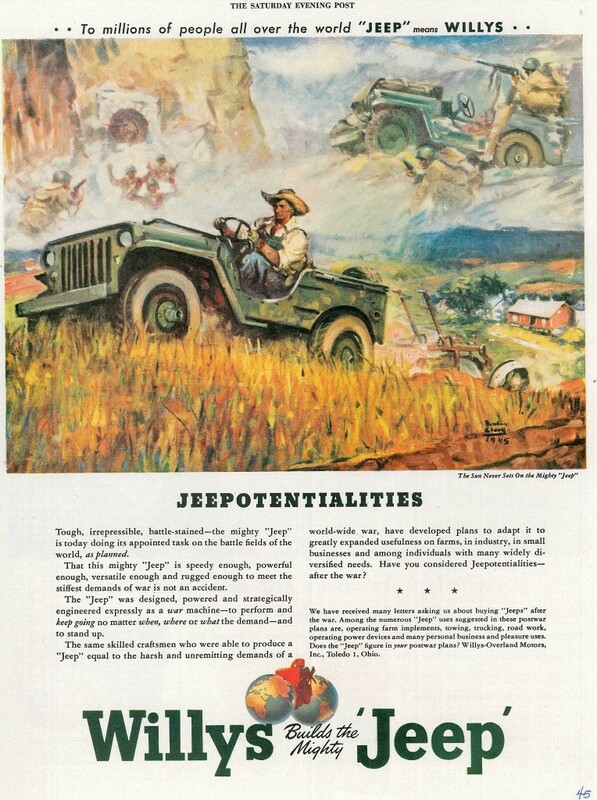 Happy 76th birthday to the Jeep. 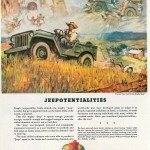 After the war Willys marketed the Jeep for farmers and suburbanites. 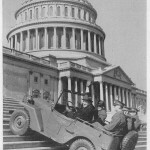 The first time the term Jeep was used in print was in the caption of this publicity photo. At a time when we have been relatively free of tropical systems for a few years, it is interesting to look back at the historical pattern of hurricane activity. This year only Hermine, a relatively minor storm, and the ‘hurricane without wind’ that dumped 30 inches of rain in about 24 hours over parts of Louisiana, have reached the U.S. Gulf Coast. Hermine was the first hurricane to hit Florida in 10 years. With all the major events that happened during WWII, it is easy to forget the regular hardships and crises that occurred. This includes tropical storm activity. In 1944 there was a very active tropical storm season in the Atlantic. 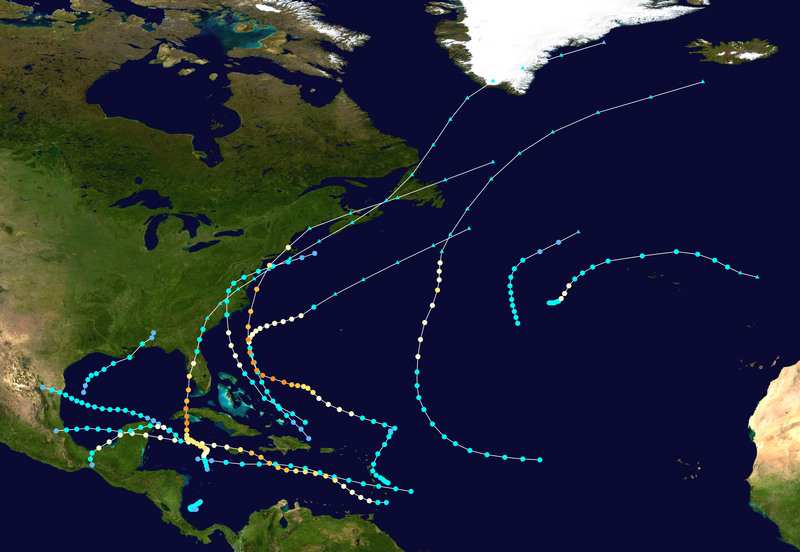 In 1942 there were 11 tropical storms in the Atlantic, 4 of which became hurricanes, 1 which became a major hurricane. There were 17 fatalities from these storms. In 1943 there were 10 tropical storms in the Atlantic, 5 of which became hurricanes, and 2 of which were major hurricanes. There were 19 fatalities from these storms. In 1944 there were 14 tropical storms in the Atlantic. Eight of those storms became hurricanes, and 3 were major hurricanes leading to 1,156 fatalities. In 1945 there were 11 tropical storms in the Atlantic, 5 of which became hurricanes, and 2 of which were major hurricanes. There were 29 fatalities from these storms. Hurricanes weren’t designated by names until 1953, so the storms of this era are named numerically, or referred to by names they got from press coverage. The two storms of the 1944 Atlantic tropical season that impacted U.S. territory were the Cuba-Florida hurricane and the Great Atlantic hurricane. The Great Atlantic hurricane of 1944 started as a tropical storm near the Virgin Islands on September 9. As it moved west and north the system gained strength and reached peak strength as a Category 4 storm on September 13 near the Bahamas. It passed the Outer Banks, and then, weakening, made landfall on Long Island, NY and again on Rhode Island. At landfall it was a Category 2 storm. It ended when it merged with another extratropical system near Greenland on September 16. 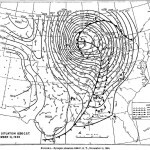 The lowest pressure recorded was 933 mbar, and the highest sustained winds were recorded at 145 mph. 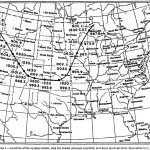 (Airplane reconnaissance of storms began in 1943. Regular radar tracking of storms began after WWII.) This storm sank the USS Warrington (a destroyer) 450 miles out from Vero Beach, leading to the death of 248 sailors. The hurricane was a category 4 producing 70 ft waves when the Warrington encountered it. The storm also sank 2 coastguard cutters, a minesweeper, and a lightship. The Jersey Shore was heavily damaged. 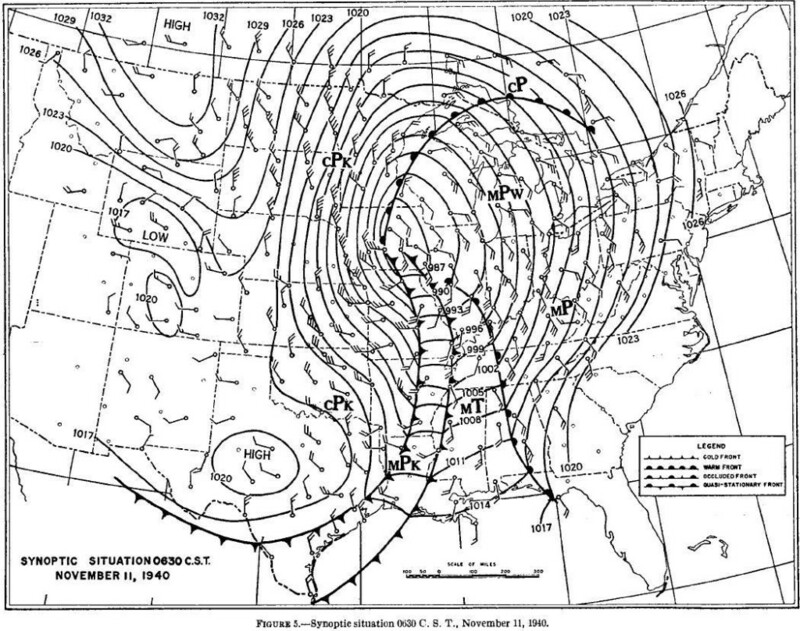 The 1944 Cuba-Florida hurricane developed off the coast of Nicaragua on October 12. The storm moved northward and strengthened, reaching Category 2 status as it approached Grand Cayman. It moved north again and still strengthened, reaching peak winds of 145 mph as it crossed Cuba. By October 19 the storm weakened and made landfall near Sarasota with a windspeed of 75 mph. It weakened more as it moved north and east across Florida, and then went out over the Atlantic near Jacksonville. When it reached Savannah, GA, it came ashore with winds near 50 mph, and moved over the eastern Carolinas, and then went to sea again near Norfolk. It traveled along the shoreline as it moved north and east, causing gale force winds off Newfoundland. The most deaths in this storm were in Cuba, where about 300 people died. 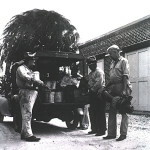 The storm also destroyed much of the Florida citrus crop. At a time when a ‘computer’ was a job title, most numerical calculations during the 1930s and 1940s were made by men and women using slide rules. 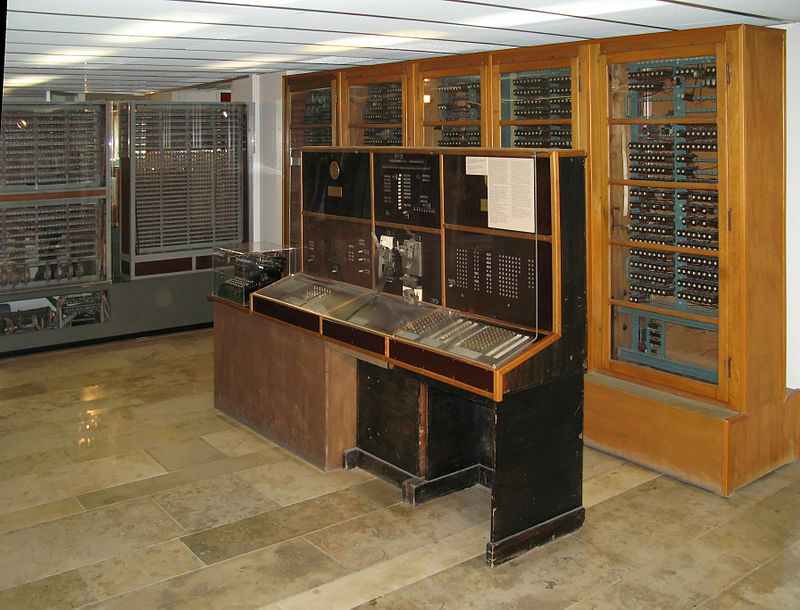 At Harvard, the Mark I was developed in 1944, and the Colossus at Bletchley Park was developed beginning in 1943. 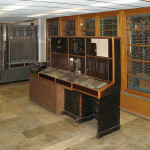 These programmable computers were preceded by the Z1, designed and created by Konrad Zuse in 1938 at his parents’ apartment in Berlin. The Z1 had limited programability, reading instructions from perforations on 35mm film. Its mechanical components limited the Z1’s accuracy. The Z1 and its blueprints were destroyed by bombing raids in January 1944. 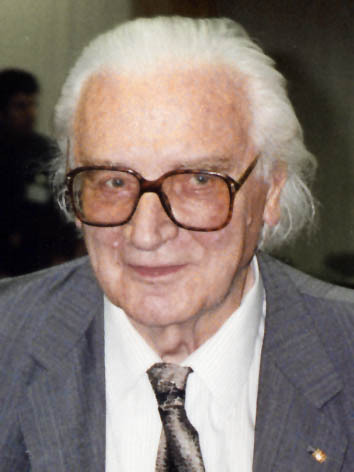 Konrad Zuse, born in 1910 in Berlin and raised in East Prussia, attended Berlin Technical University and graduated with a degree in Civil Engineering in 1935. He worked on his computer in isolation from other computing researchers because of the growing economic and political isolation of Germany. In 1939 he was inducted into the Germany Army, and given the resources and charge to build a better computer. The Z2 was completed in 1940 and took up two rooms of Zuse’s parents flat. It used telephone relays to extend its computing power. The German Research Institute for Aviation gave him funding to start a company, and Zuse moved to an office. There he built the Z3 using even more computer relays. This machine more was more flexibly programmable and had memory. The German government denied funding for Zuse’s computing project, deeming it to have little immediate utility. Bombing raids destroyed the Z2 and Z3, and led Zuse to pack up the almost finished Z4 in February 1945 and ship it to Gottingen. Work to complete the Z4 was halted until 1949. During this hiatus Zuse developed a programming language he called Plankalkül (plain calculus). He had found programming in machine language very difficult, and so wrote the first high-level computing language. Zuse died of heart failure in 1995. Two years later the Z4 was shown to be Turing-complete. The reconstructed Z4 electromechanical computer. 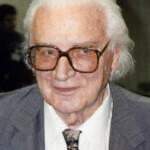 Konrad Zuse, photograhed in 1992. In 1943 James Wright, a Scottish-born engineer working for General Electric mixed silicon lubricant with boric acid. It was too sticky to be the artificial rubber he wanted, but when he dropped it it bounced. It was interesting enough for a patent application. Engineers with Dow Corning filed a very similar patent slightly later. The product of the patent was developed into a toy, called Silly Putty, in 1949. Today about 6 million eggs of Silly Putty a year are sold by Crayola, who purchased the rights to sell Silly Putty in 1977. 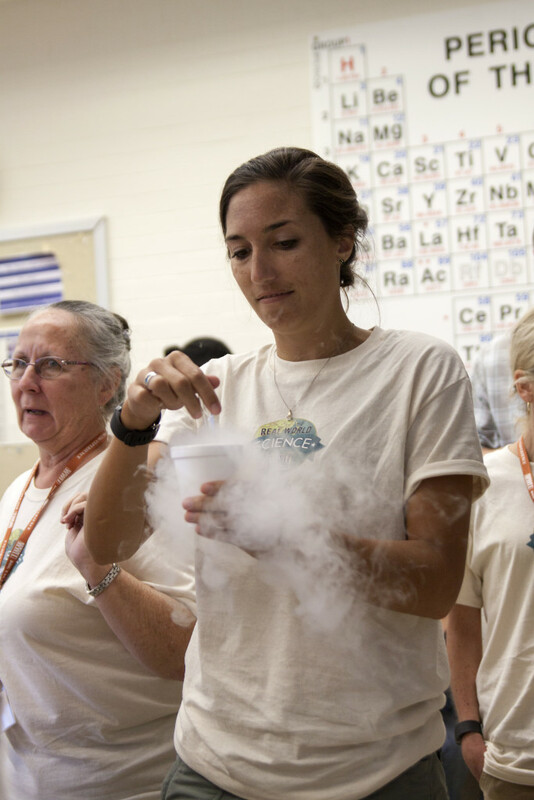 Silly Putty is a non-newtonian fluid–this means that it has characteristics unusual for a liquid or a solid. 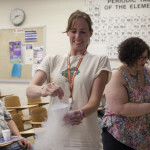 If left in a shape it will eventually flow to a flat shape like a liquid. However it bounces, and when struck strongly and sharply will shatter. 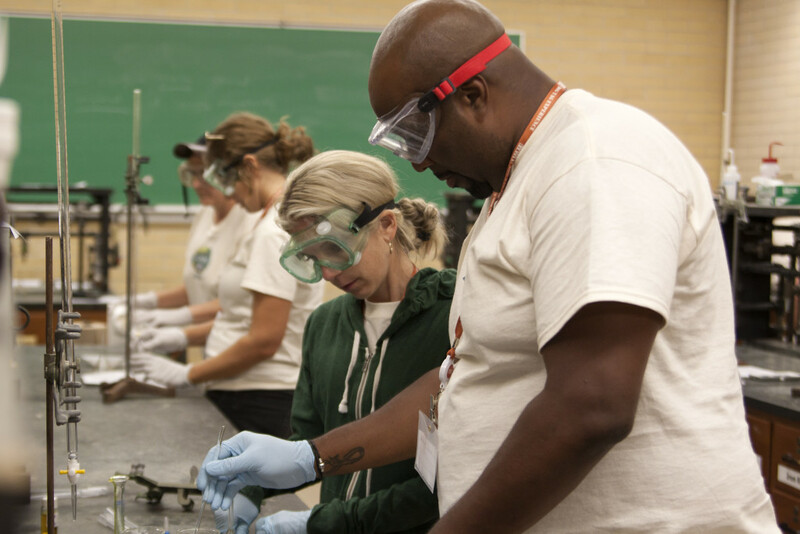 Because it is made of silicon lubricant, if your Silly Putty gets stuck on a pourous surface (like hair or fabric) you can dissolve it with WD-40 or alcohol. 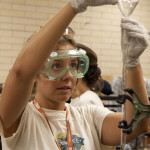 Dissolve the borax in the water, and then mix it with the glue. Put the resulting polymer into a ziploc bag and knead it until it forms a nice stretchy mass. Pour remaining liquid down the drain. On June 20, 1922 a German company filed for a patent on a new formulation of a pesticide/insecticide, which it called Zyklon B (zyklon is German for cyclone). 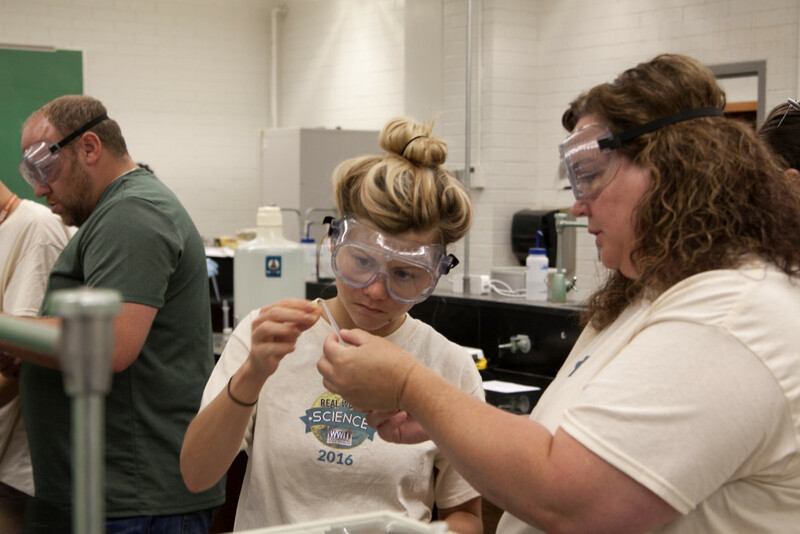 After its first use as a pesticide in California citrus plantations in the late 19th century, hydrogen cyanide came to be used in all sorts of circumstances as a fumigant. In the US it was used to fumigate train cars, the clothes of immigrants, and in Germany it was used to kill lice and rats. In World War I, a form of hydrogen cyanide, known as Zyklon, used as a chemical weapon by the German military. After World War I, this form of hydrogen cyanide was banned. The scientists at a German chemical company came up with a new formulation, getting the cyanide from the waste products of sugar-beet production, and packaged the hydrogen cyanide with diatomaceous earth in a canister, along with a chemical irritant to warn of the product’s toxicity. They called it Zyklon B to differentiate it from the earlier, banned, product. From 1922 to the start of the war, most of the sales came from outside of Germany. 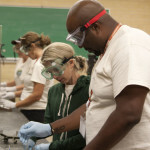 Hydrogen cyanide is a very potent toxin. 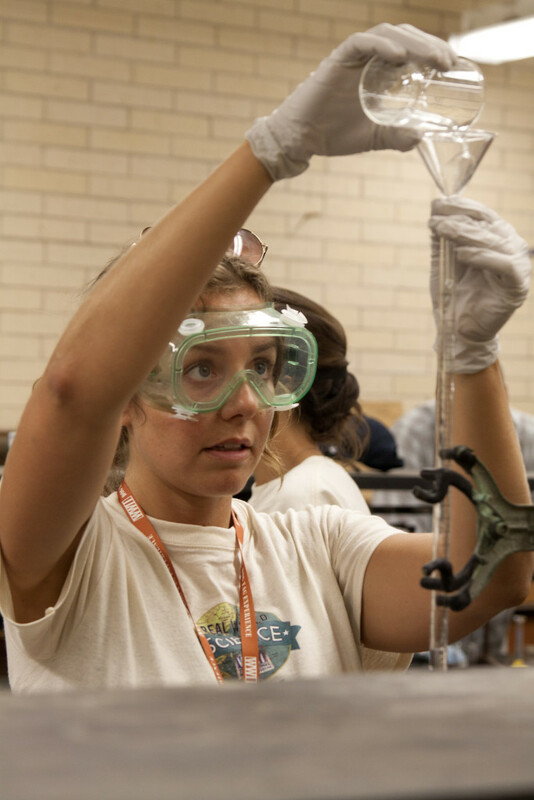 It binds with the iron compound in an enzyme called cytochrome c oxidase in cells. This enzyme is necessary in production of adenosine triphosphate (ATP), which is required by cells in energy transfer. Without ATP cells cannot survive, and without cytochrome c oxidase cells can’t make ATP. Hydrogen cyanide reacts with cytochrome c oxidase and keeps it from making ATP. In aerial forms, such as Zyklon B, it enters the body quickly. In a human of about 150 lbs only 70 milligrams of Zyklon B can be fatal in 2 minutes. In 1941 the German SS was experimenting with methods of efficiently killing prisoners. 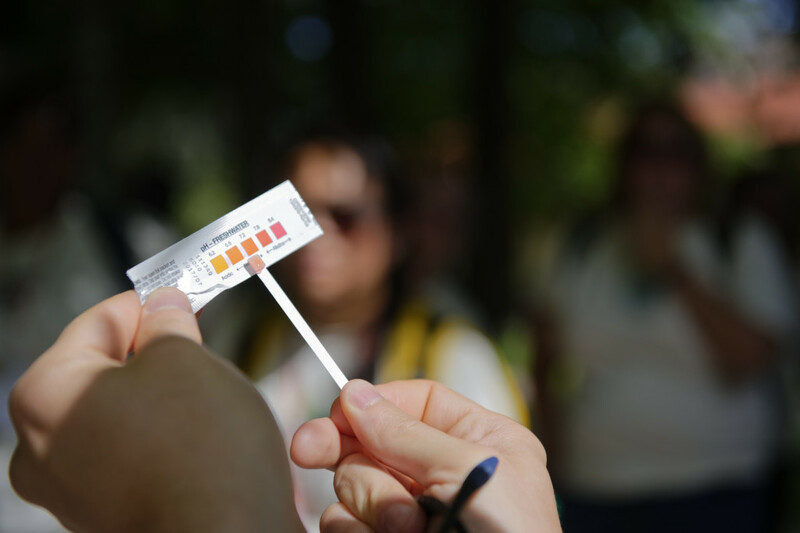 A captain tested Zyklon B on a group of Russian POWs at Auschwitz in a building basement. By early 1942 Zyklon B became the SS’s preferred method for killing prisoners and was used to kill at least 1 million prisoners. Many of these were at Auschwitz, where the practice originated. Two of the scientists who developed managed Zyklon B production were tried and executed in British military court for knowingly delivering the chemical to kill prisoners. 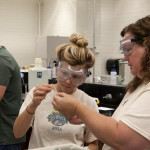 Different forms of hydrogen cyanide are still used today as pesticides. 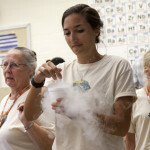 Hydrogen cyanide, while highly toxic, is a simple combination of three common and essential elements of life: Hydrogen, Carbon, and Nitrogen. A scene from 1939 New Orleans--men about to fumigate a warehouse with Zyklon B.